I help you understand and speak English with confidence and ease. I’m so glad that you decided to take another step toward becoming more confident when you speak English. Get ready to expand your comfort zone. The eGuide is just one resource available to you on the subscriber page. Lesson guides and transcripts for my most popular podcast episodes, new audio versions of my short stories, and more await you when you become a subscriber. With each monthly email, you’ll receive a new password and updates about my latest projects. Just click the boxes that say “email” and “special offers” when you subscribe. Are you ready for insider information? Sign up to receive monthly emails from me that will offer you access to free subscriber resources. I will never share or sell your email address. You may unsubscribe at any time. P.S. 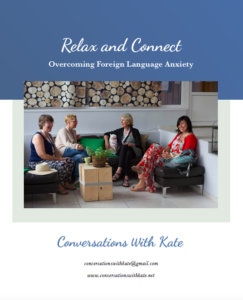 Please add conversationswithkate@gmail.com to your address book. If you use Gmail, please drag my email from your Promotions inbox to your Primary inbox. Click “Yes” to the pop-up question so they will show up there in the future.